Cookbooks by artisan food makers the darlings in the publishing arena nowadays, and the passion I have for chocolate had me recently racing over to Central Bottle + Provisions to meet, greet and eat with the masterminds behind Mast Brothers Chocolate. 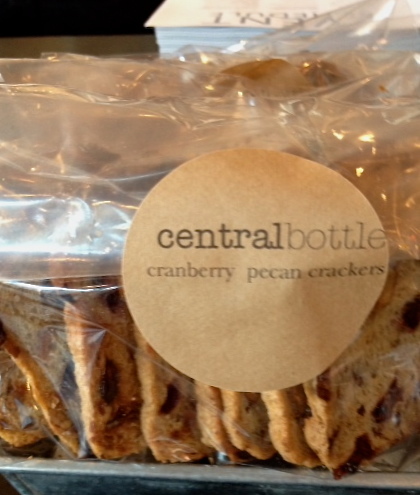 Although I originally knew Central Bottle as a wine shop, I delight upon continually returning to the shop as it continually adds to its food arsenal at a very fast clip. Once the home to just wine and cheese, monthly visits has me discovering a plethora of new exceptional goodies – most recently, cookbooks signings by chefs or artisan food purveyors, gives one yet another reason to step inside. This fantastic shop commands a dedicated audience that they are totally worthy of. The cheese selection is varied, and covers not only unique cheese makers from predominately New England farms, but also those high-falooting cheese mongers from abroad. A cache of Iggy’s breads sits behind the counter, while locally made crackers are stashed about. Cured salumi are to be noticed too, sitting quietly on display, and seeming to whisper “don’t forget me” as you wander by. 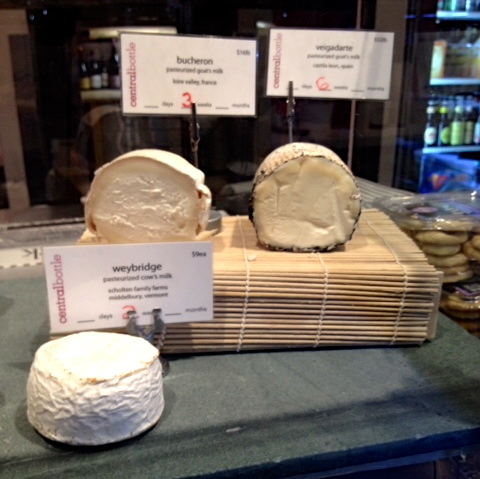 Bread, crackers, charcuterie: all perfect accompaniments to anyone’s cheese board. 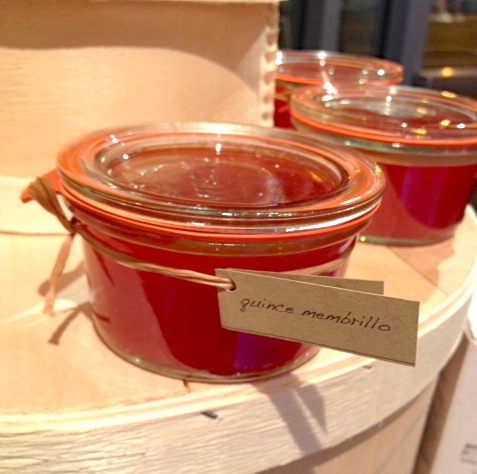 House-made preserves and sauces by in-house chef, Stacey Daley, are perched upon tables and shelves. Italian plum and Concord grape jam along with quince membrillo and other pantry items and pickles always catch my eye. 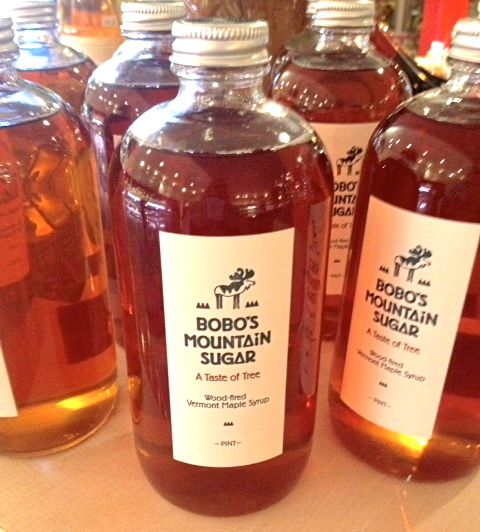 Bobo’s Mountian Sugar bottles, sparkling with golden sweetness, are stacked front and center and had me thinking of pancakes immediately. A must have for any holiday breakfast and beyond. 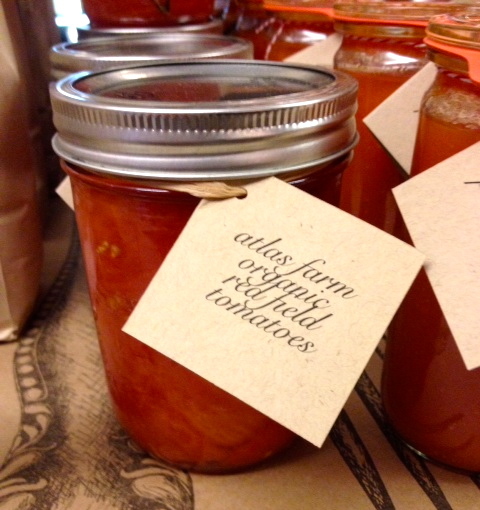 Dinner supplies for anyone thinking Italian, include beautifully bottled stewed tomatoes and passata di pomodoro, both made from Atlas Farm tomatoes. 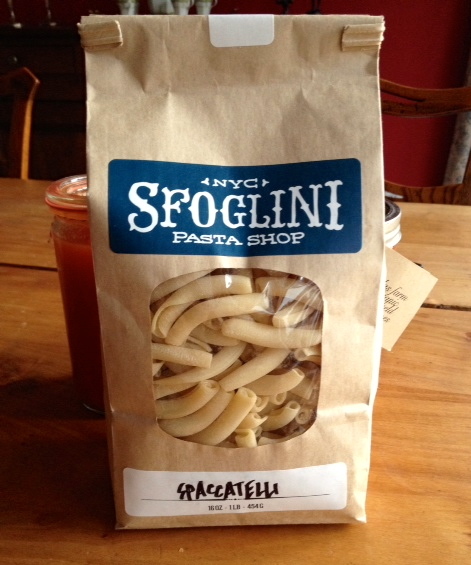 And not to be forgotten – pasta from the Sfoglini Pasta shop in Brooklyn, NY. Throw in a loaf of Iggy’s bread and a dinner can be prepared in a matter of minutes once you get home. There are the meticulously designed chocolate and confectionery offerings for those of us with a sweet tooth. Locally made and decandently delicious, EH Chocolatier bonbons and bars, catch ones’ eyes at check out, along with Mast Brothers Chocolate Single Source bars. 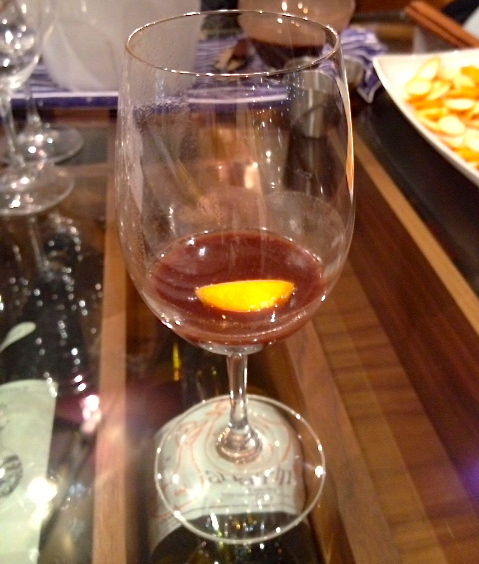 How can one possibly leave without adding chocolate to the the mix? Caramels, a newly popular artisan confection, are there for the taking as you check out. 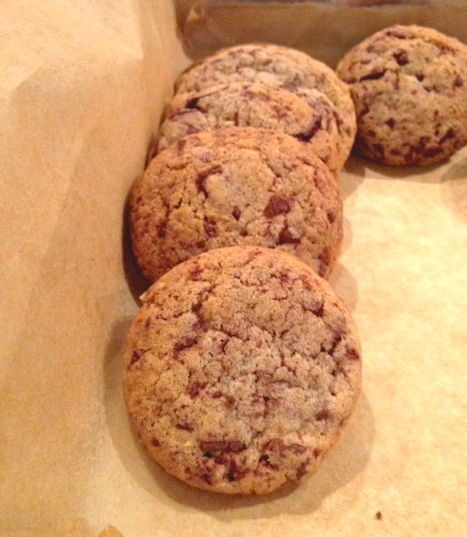 Who can resist popping one of this tasty temptations into your mouth while waiting for your parcel of provisions?! The “piece di resistance” on this particular evening was the meeting the Mast Brothers from Brooklyn, New York, founders and proprietors of Mast Brothers Chocolate, who had collaborated with Central Bottle and Chef Stacey Daley to prepare a few items from their cook book for patrons to sample and to entice one for purchase. There were delicious chocolate chip cookies made with finely chopped pieces from a dark chocolate bar and a dark chocolate molé, more along the lines of a molé Oxaca, served with a bite of chicken. But what caught my attention was the Chocolate Black Velvet libation – champagne, stout, melted chocolate, orange bitters and peel – tasting this concoction of chocolate, a touch of fizz and hint of orange, was a surprising delight and had me leaving my night at Central Bottle + Provisions with a book in hand, along with numerous ingredients for a wonderful meal. If I’ve tempted you at all, just watch the Mast Brothers Chocolate video and you’ll be ordering the book not only for yourself but all chocolate lovers in your address book!